Today the card I'm going to share with you was made in September 2006 for Sue and Harvey. I don't think there has ever been a stamp from Imagination Craft's that I have disliked ! This is quite a simple card but needs a little time and patience when shaping and glueing the wires in place. Fold some white card in half portrait style. Stamp the flower swirl onto a spare piece of white card. Paint with Twinkling H2 os. Paint the three largest flowers with the Ocean wave and the smaller flower with the Indian copper. Cut out the flower heads only and glue in position on the blank base card, in the position they would be in if you had stamped the flowers on the blank base card. Stamp the flowers again onto spare white card, colour then cut out and 3d them onto the flowers on the base card, using sticky foam pads or silicone glue. Lightly paint around the flowers with the Ocean Wave H2 o.
flowers using the diamond glaze. Spread a thin layer of glitter glue around the wires. Add a small blue ribbon to the top right hand corner of the card. 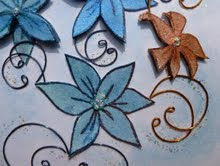 Add some glitter glue to the flower centres, that's it the card is finished. Hope you are enjoying your week and are managing to fit in some crafting time. My card today is one I made in September 2009 for Sue and Harvey of Imagination Crafts. I really liked this stamp as it had a modern touch to it, a little different from their usual stamps. I hope you like what I did with it. Fold an A5 card in half portrait style. Take the vellum and colour the back of it with oil pastels. Fix this to the base card by putting a strip of double sided sticky tape on the back of the card and fix the vellum to it and then bend the vellum around the fold of the card to the front. Glue the vellum to the front of the card. Cover with the angel hair. Take some white card and run the Rollagraph stamp over it, using the brown Stazon pad. Colour over this with the oil pastels and run the brown Stazon pad around the edges. Tear this card into two pieces to fit across the top left and bottom right corners, leaving 2 of the edges straight. Glue these into position. Using another piece of vellum, the stencil, light box and embossing tool, dry emboss the design onto the vellum. Take off the light box and colour the back of the vellum with the green oil pastel. Cut out the shape and glue to the bottom left of the base card. Take some white card and colour with the oil pastels, then stamp the lollipop flowers onto the centre using the brown Stazon. Trim randomly around the image and run the brown inkpad around the edges. 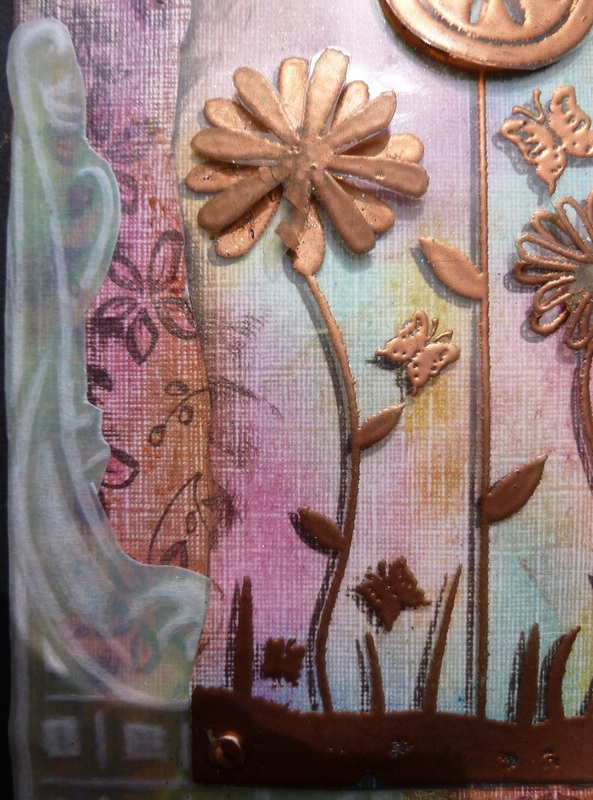 Stamp the flowers again onto acetate with the copper pigment pad, twice and heat emboss using the copper embossing powder. Fix one image over the coloured card, moving the copper image slightly to one side of the brown image. Punch a hole in each corner of the acetate and the card. Insert a brad into each hole. Glue this panel to the base card. Cut out all three of the flowers from the second piece of acetate and glue onto the original copper image, using silicone glue, off setting the flowers slightly. Well that's it folks, one lollipop flower card. Thank you for popping by to have a look. See you again soon with another flower card in which I use some wire, see you soon. Today I would like to share another card I made for Sue and Harvey of Imagination Crafts in September 2008. This card shows another way of using the daisy chain stamp. Stamp the threads stamp on the top right hand and bottom left corners of the white base card. Stamp the daisy chain stamp on top of the threads stamp using the pixie dust chalk inkpad at the top right corner. Stamp the daisy chain on top of the threads stamp on the bottom left, but upside down this time using black inkpad. Decorate the edges of the card using the flower border stamp and the pixie dust chalk pad. Stamp the daisy stamp onto some gingham paper and cut out. Glue to the pink stamped daisy. 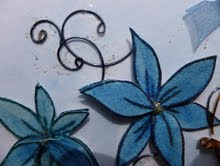 Add glitter glue to the flower centres. 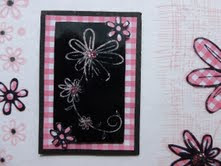 Stamp daisy chain onto black card using the pink chalk inkpad. Cut out the flowers and glue to the black stamped daisies. 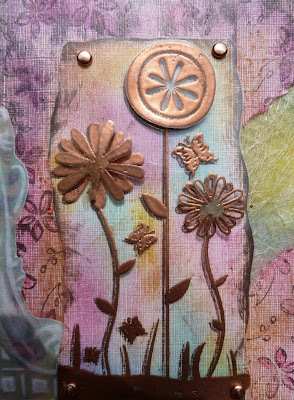 Stamp the daisy stamp onto some black shrink plastic using the chalk inkpad and cut out then shrink with heat gun. 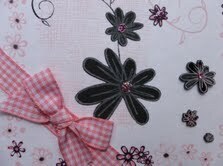 Mat onto gingham paper leaving a border showing. Mat this onto black card, then glue to the top left of the base card. Add glitter glue to flower centres. Fix some pink gingham ribbon across the bottom left. Stamp the border flowers a few times onto the gingham paper using black inkpad, cut out and glue them randomly around the border. Phew ! that's it friends, another design using the daisy chain stamp. 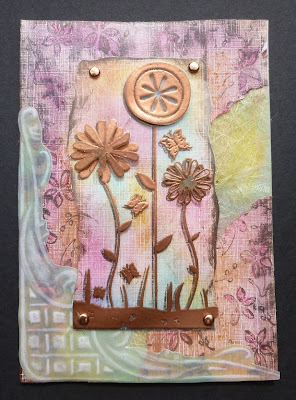 My next card will also feature the daisy chain stamp so please pop back. It is amazing how one stamp can be used in so many different ways.